Powered by the 2.0L Clean Diesel TDI, delivering 140 horsepower and 235 ft.-lbs. of torque, the new Jetta SportWagen does not conform to old station wagon stereotypes. Using readily available body components and finished in custom paint and graphics, this Jetta TDI SportWagen demonstrates what can be done to personalize a Jetta. To reinforce the sportin this wagon, the Jetta’s underpinnings were upgraded by H&R Springs to lower its ride height, and make its handling razor sharp. 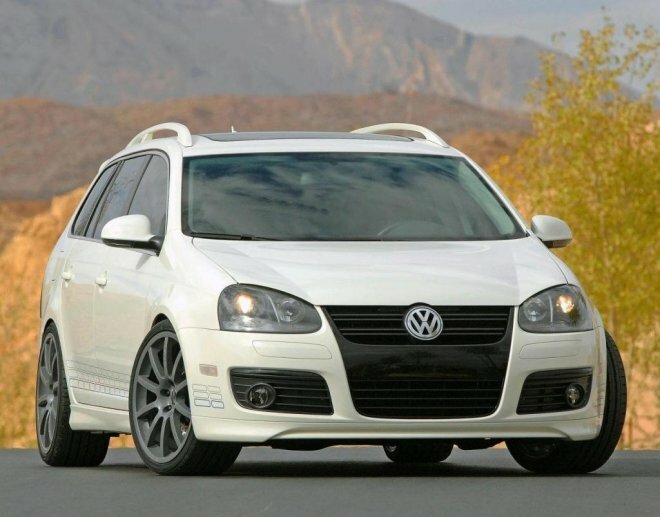 The Jetta TDI SportWagen remains firmly planted with 19 inch Sportec Wheels and Yokohama Tires wrapped around an upgraded Brembo brake kit, providing high performance stopping power. Hella provides up-level lighting components that add a unique flair to the styling.